We’re heading for the final 10,000 km between Rosetta and comet 67P/C-G today, with four of ten rendezvous burns left to complete before arriving on 6 August. Tomorrow’s burn is the third of four so-called ‘Far Approach Trajectory’ (FAT) burns that are being conducted once a week in the period 2–23 July. As reported last week, the 9 July burn was successfully completed; lasting 46 minutes 2 seconds, it achieved a change in velocity of 25.7 m/s. Once tomorrow’s burn is complete, there is one more ‘FAT’ burn scheduled for 23 July, which will reduce the velocity by 5 m/s; then a pair of “Close Approach Trajectory” (CAT) burns on 3 and 6 August will will impart changes in velocity of about 3 and 1 m/s, respectively. Thus, in 22 days time, on 6 August, we will have covered 99% of the remaining distance to the comet, rendezvousing with the comet at a distance of 100 km. Eventually, the plan is to come to within just 10 km altitude, although there are many unknowns including the comet’s mass, gravitational field, and activity which need to be determined and understood before Rosetta can move in that close. What will orbiting at an altitude of 10 km really look like? By now, you are used to seeing artist impressions of the spacecraft around the comet, but of course these are usually from a perspective that shows the spacecraft and comet at roughly the same size, with the former in the foreground and the latter in the background. In reality, Rosetta with its 32-metre solar array “wingspan” is less than 1% of the size of the comet, which is roughly 4 km across at its widest point. To get a better sense of the relative size of Rosetta and 67P/C-G, the image included in this blog post shows Rosetta and the comet to scale, with the spacecraft at a close orbit altitude of 10 km. This graphic still uses an artist impression of the comet based on a shape of derived from ground-based observations made some years ago, but in a matter of weeks we’ll be able to replace it with what comet 67P/C-G actually looks like. Indeed, we’ll get an update on that in our regular image release here on the blog on Thursday. Rosetta and comet 67P/C-G to scale, assuming Rosetta is orbiting at a distance of 10 km, and the comet is about 4 km wide. Click to download higher res version. Credits: ESA. Thanks for the pic ! 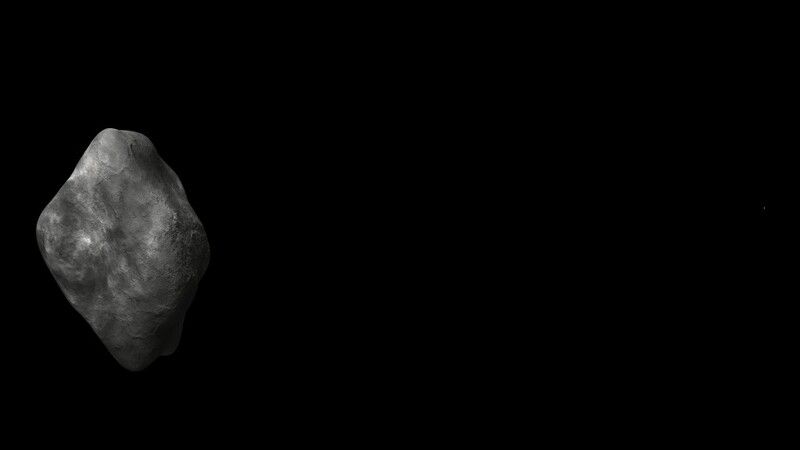 Cant wait too see 67P/C-G in all its beauty. Would love to see a daily recent picture; should become quite spectacular now! Could you provide us with some information about contact binary nature of the nucleus that is visible in images from July 11th? There is already an article on Emily Lakdawalla’s blog at the Planetary Society: http://www.planetary.org/blogs/emily-lakdawalla/2014/07150633-quick-rosetta-update.html but it would be great to read some first-hand news (and maybe some more information) here. If confirmed, that would be truly amazing! Are these pieces more likely fragments of one body broken apart by some impact or tidal forces, or could they be distinct comets that originated independently from each other? Will be worth scanning the DLR, CNES, etc sites over the weekend for the images to be obtained this Friday. What a shame. Your blog is failing you (and us!) when the news on the BBC is more up to date than on your site. Then next month is critical, not only for your mission, but also in your timely presentation of news and photos. ten day old photos are simply not good enough. It rotates clockwise from ROSETTAs point of view (rot values decreasing). I double checked on http://comsim.esac.esa.int/rossim/3dtool/ because it looks so unusual. Must have been a grazing impact. Also adding to the questions, are any new pictures available? It is simply amazing to watch. I would have some other questions. What will be expected orbiting velocity at a distance of 10Km? I did my own estimate, it shall be about 1.4 m/s, am I right? It gives 13h orbit period (at 10km distance). And the most interesting question, will rosetta or its landing module be able to detect any kind of organic molecules, or even RNA molecules? To bring some light to origin of life. There are speculations that it could come from commets, possibly in the form of RNA self replicationg molecules in ice environment. (which is almost the same as the line of sight to earth). This is to avoid flying through the coma if activity rises. So, your question on residual velocity after the last CAT-maneuver has no simple answer. Or, I calculated, the orbiting velocity and time at 100Km distance shall be about 0.4m/s and 17 days, is it as expected? 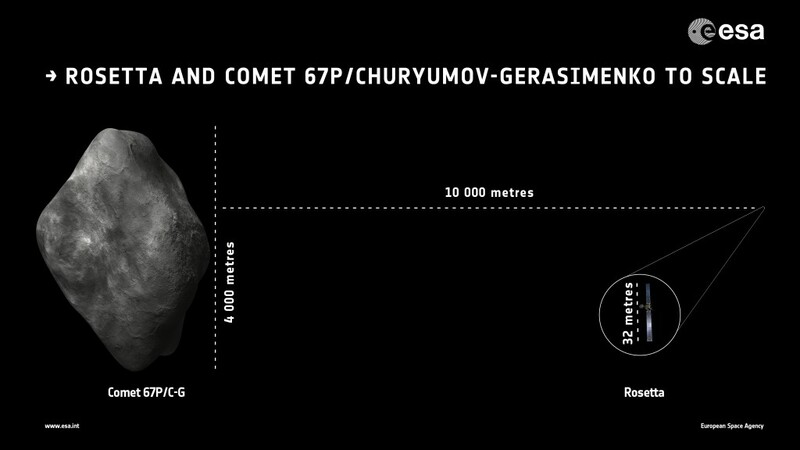 So, rosetta has to slow down to about 0.4 m/s relative to comet. Dear all, yesterday’s preview was unscheduled, which is why you did not see it first here on the blog. We’ll be putting out even newer images and a movie of comet 67P/C-G, along with scientific commentary, in tomorrow’s planned weekly image release. A realtime stream of images have been state-of-the-art for decades for many US missions. ESA public relations got lost far in the last millenium. Dear Emily, my interest is just a kind of amazement of regular human being, not a scientist. Thanks for quick reply regarding “policy”, but do not forget that also ESA is paid from taxes. Do I take it correctly that news will be released after 6 months??? Thank You very much Emily for your never wavering honesty and integrity with us. Please do let us know how the Third ‘FAT’ burn goes. Rosetta is shaping up to be one of the all time greats, and yes I will remind people about the three amazing Earth – Moon swingbys, the incredible Mars encounter including unique views of Phobos and the two astonishing Main Belt Asteroids 2867 Steins and the huge 21 Lutetia encounters and now 67P/ Churyumov-Gerasimenko is showing her strange shape. I wonder too along with poster hnc about the double nature of the nucleus? Are they bits off the same parent body or indeed two entirely seperate comets that made a light contact and fused or froze together? The fantastic image ‘relese’ yesterday, shows no sizable impact craters on either of the lobes, and these images are certainly sharp enough to show that. I agree with Andreas that the rotation is retrograde, from east to west. For those following today’s burn: I just got word that it was completed successfully! Thank you very much Emily for your extremely prompt response. Excellent News about today’s burn, 67P/ Churyumov-Gerasimenko, you have nowhere to hide MWAH HA HA HA 😀 !!!!!!!!! I wish the Rosetta team every success in working out an effective navigation- and Philea landing strategy at this terribly short notice, now that “conventional” models that have been prepared for the comet’s shape and gravity field may no longer be useable. There seems to be an emphasis on such a shape forming by capture. But that seems to demand an accidental Rosetta! – a very slow close approach, at ~m/sec. If they were in orbit, it would be extremely unstable to external perturbation. So it seems rather unlikely. In contrast I suspect some sort of ablative mechanism is far more likely. As a climber, I’ve seen very strange large structures caused by selective sublimation of ice, one small stome sitting on a huge pillar. And in laser ablation of solids very complex structures develop on a flat surface with uniform illumination – on a very different scale. So it seems to me Occam’s razor would lead me more to the ablative explanation than to capture. Lets hope the data sorts it out. Occam had more than one razor. Ablation is possible, yes, much more likely than a chance impact of two objects. But another likely mechanism is an impact which breaks up a parent body into fragments, two of which depart the crash scene at very similar velocities and coalesce at low relative speed. This mechanism has been invoked to account for asteroid satellites and other binaries, with Occam’s blessing. Hi Harvey, good point! But we must consider that this object may have been formed far out in oorth cloud were relative speeds are lower. BTW, what I wondered about is not the retrograde spin with respect to ecliptic. The offset between those bodies lets me think, that the round one (rubber duckies head) hit the pebble shaped one with an offset and gave the whole system its spin. But for this assumption, its just spinning the wrong direction! Looks really strange. Could outgassing induce such a spin? Theory is, that it spent most of its life far away from sun, right? So would such a small object ever feel enough tidal force to break it up? To do so it needs to get close to something very heavy, so M/R^3 compensates for small size. Again we need a ‘special case’ it seems. Not a betting man, but my money would be on ablation; we’ll see – I hope! I do not know how you calculate this. It is important to understand, that rosetta will never be in a closed orbit around the comet. It is simply too fast, the escape velocity is around 0.06 m/s at a distance of 100km, and rosetta will always move with more than 4 m/s relative to the comet (philae is a different story, it will hopefully slow down to 0 m/s by impact). Rosetta does move on hyperbolic arcs (almost straight), when it does not use its thrusters. From time to time (every 3 or 4 days), it will do a little maneuver to change direction by roughly 120 degrees and so it will move on an equilateral triangle around the comet. The first triangle is planned to take 11 days. From what I understand, ESA have prepared different scenarios. They will choose between them depending on what they find (activity, shape, gravity field etc). After all, it’s most likely they develop a new plan, using one of the prepared scenarios as a template. These values are from Scenario A, all speeds/distances are relative to 67P/C-G.
* At 2014-08-06T09 UTC, the spacecraft will slow down to 4.3 m/s at a distance of 117km. * It will then move on an hyperbolic segment, reach periapsis at 2014-08-08T09 UTC with 4.34 m/s at 91.6km. * At 2014-08-10T09 UTC, s/c will change direction and speed will change from 4.3 to 5.7 m/s at a distance of 117km. * It will then move on an hyperbolic segment, reach periapsis of 90.7 km with 5.8 m/s at 2014-08-11T21 UTC. * At 2014-08-13T09 UTC, s/c will change direction and speed will change from 5.7 to 4.3 m/s at a distance of 117km. * It will then move on an hyperbolic segment, reach periapsis of 91.3 km with 4.36 m/s at 2014-08-15T09 UTC. * At 2014-08-17T09 UTC, s/c will be roughly in the spot where it was on 2014-08-06, completing one inspection tour around the comet. Phil, thanks. Fracture and stick back together seems more likely than random capture. But it’s not obvious to me why this is a reasonably probable outcome of the impact. In an impact violent enough to shatter a large body, is there a mechanism that makes the generation of large bits at very low relative velocity likely? If it’s been seen several times and attributed to this mechanism, it has to be a probable outcome and have a specific cause.